Pen and ink drawing by Sir Charles D'Oyly (1781-1845), of a wooded rock with a view of peaks on the road to Raghunathpur in West Bengal, dated 4th February 1823, from an album of 80 drawings of views in Bengal and Bihar taken between January 1823 and May 1825. The largest group of drawings consists of sketches made between 26 January and 27 February 1823 during a journey from Calcutta to Gaya (Bihar) along the 'New Military Road'. This road passed through Manbhum district (Bihar) to Hazaribagh (Bihar) and through the hills to the north-west to join the present Grand Trunk Road near Sherghati (Gaya district, Bihar). Begun in 1782, it had semaphore signalling towers, built along it in the early years of the nineteenth century. 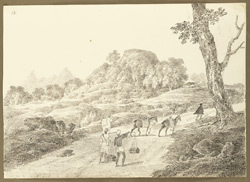 This image is the original sketch later adapted for plate 3 of 'Sketches of the New Road in a Journey from Calcutta to Gyah' (Calcutta, 1830). D'Oyly wrote, "This rock forms a very picturesque object from the Road and is situated about three miles from the village of Ruggoonauthpore. It is richly covered with foliage on one side and partially so on the other, and the connected triple peaks of a rocky hill are seen faintly in the distance."